HOMD’s release date has been postponed to the 3rd of February. This is a decision I didn’t want to have to make, and I’ve only come to it after lots of discussion with the people at Failbetter, and a lot of thought on my own part. Once again, I’ve been conned by my own optimism. I had thought the September release was eminently achievable, but unfortunately I hit an unexpected bottleneck – integrating written content into the game took about 1.5x as long as I expected it to. With over 250,000 words of text to add (and another 50,000 still left), this had a huge knock-on effect and thoroughly ruined my schedule. In an effort to meet the deadline, for the last three months I’ve been working 14-16 hours every day, and only very occasionally taking a day off. There’s no way I can crunch any further or any harder! I say this not to get sympathy (because I love what I’m doing), but to assure you that I have been trying my best not to have to resort to another delay. I’m very sorry to everyone who was looking forward to playing HOMD in September. All I can do is assure you that this delay will ultimately make for a much better experience. The game will have more content, fewer bugs, and much more polish. I’d also like to assure you that HOMD is shaping up to be quite fine. I think I’ve exceeded my own ambitions, and while I’m disappointed in myself for the six-month delay on the promised date, I’m feeling good about the quality of the project. Hopefully this won’t be a Kickstarter pledge you regret. When it releases in February it will have been a 2-year-long project (including the time I took to learn to code) and I think that, considering the sheer amount of stuff in the game, this is still a reasonable turnaround. I hope you agree! In order to prove that I haven’t just been twiddling my thumbs for six months, I have uploaded a massive new update to the alpha on Steam. It adds over 250,000 words of story, including 30 different stories for your crew and a number of side-quests. 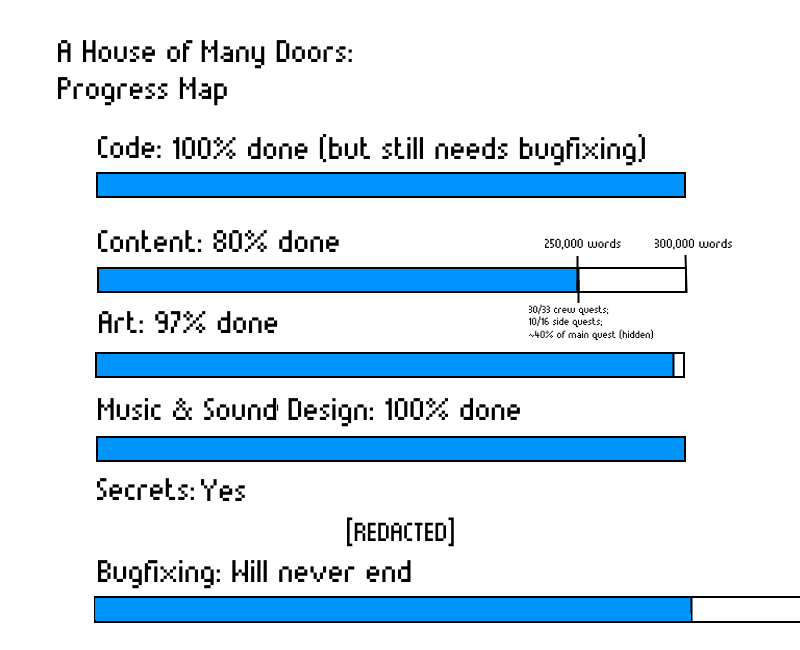 I’m still holding back the ‘main’ questline – which I don’t want to unveil until it’s fully finished – but overall, HOMD now features 80% of its final content. If you were hesitant about trying out the alpha, now’s the time. With so much more content comes a whole new host of bugs, so I need your help. And with all this stuff to do, playing the game will now actually be fun. Until you crash and have to submit a bug-report.